This portrait of King Carl Johan III was painted by Caroline Cathinca Engelhardt and is hung in the Bernadotte Parlour at the Royal Palace. Caroline Engelhardt (1845-1926) was born in Copenhagen and studied art in Düsseldorf and Paris. In 1875 she spent time in Christiania and Stockholm, and she lived in a number of other cities in Europe until she settled in London at the beginning of the 1880s. Her production consists primarily of genre paintings and portraiture. King Oscar II commissioned Engelhardt to paint the portrait in 1875 in connection with the official unveiling of the statue of Carl Johan in the Palace Square. The painting was part of King Oscar IIs dynastic programme. He wanted to display pictures of all the members of the House of Bernadotte at the Palace in Christiania as a sign of his legitimacy as union monarch. The full-length portrait depicts King Carl Johan in his uniform as Marshal bearing insignia for the Swedish Order of the Sword, Order of the Seraphim and the Order of Carl XIII. The pose is identical to that used in the portrait painted by Francois Gérard (1770-1837) after Carl Johan had been elected Swedish heir to the throne in 1810. Here, Carl Johan is painted wearing the uniform of a Swedish senior government official even though he was still in France. 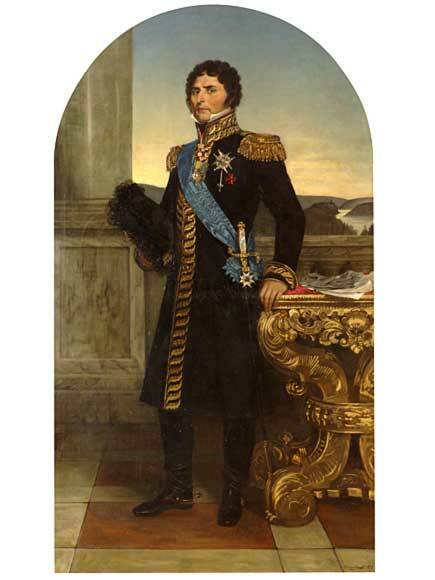 Carl Johan sent that portrait to his adoptive father, King Carl XIII. Gérards portrait is said to have been King Carl Johans favourite portrayal of himself. Both Gérards full-length sketch (which is now found at the University Library Picture Collection at the University of Oslo) and the portrait itself are relatively flattering compared to other portraits and caricatures of the King. Sir Hudson Lowe, Governor of St. Helena during Napoleons incarceration there, had met Jean Baptiste Bernadotte in Madame de Staëls salon in Paris. Lowe is said to have remarked that his nose was uncommonly large and beaked. However, the nose as rendered in Gérards painting and Engelhardts posthumous version is of moderate size. In 1810, Swedens Wasa dynasty was dying out. King Gustav IV Adolf was deposed by a coup detat in 1809 after Sweden was defeated in the war with Russia, ceding Finland as a spoil of war. He was succeeded by his elderly, childless uncle, King Carl XIII. On 21 August 1810, in Örebro, the Riksdag of the Estates elected the French lawyers son and brigadier-general Jean Baptiste Bernadotte to become King Carl XIIIs heir. Jean Baptiste took the name Charles Jean, which became Carl Johan in Swedish.